This is part 2 of my series on Mars, planet of surprises, great to explore, not so great to colonize We saw so far that Mars is less hospitable than the coldest driest deserts on Earth. This is Wright valley, which is colder than it looks. It's an extremely cold place in Antarctica which only stays free of ice because it is also so very dry. The most hospitable areas on Mars may be similar, except for the near vacuum of its atmosphere. Surprisingly, in these extremely hostile conditions in Antarctica, you do get life, and this gives insight into possibilities for life on Mars. This is life living on the edge, crypto-endoliths that live hidden underneath the surface of rocks. They live life in the slow lane. They are amongst the longest lived micro-organisms on our planet; a single cell will live for millennia. This makes studying their lives very difficult. It is a sort of cross between micro-biology and archaeology. You can get clues to their lives from the way the rocks flake off, as colonies develop. This leads to a fresh patch of rock and a new colony, so you have different stages of this process on the rocks, and you can take a look at this evidence, and figure out what happens over periods of thousands of years. If there is any life like this on Mars, it is going to be difficult to study and it will be hard to detect any signs of it. It is probably going to be slowly metabolizing, make almost no difference to the atmosphere, and consist of small communities of microbes. This is for the most hospitable regions of the surface of Mars. So, if there is life on Mars as there might be, then it will probably be hard to detect. This is a photograph that Viking took, of the surface, quite close to the equator, and the white, which looks like frost, it is frost. Viking 2 lander photograph of ice on the surface of Mars not far from the equator. You might be quite surprised at this picture, if you read the previous article, because in these equatorial regions, the soil is extremely dry. There is thought to be no ice at all in these regions, for a fair bit below the surface. So where does this frost come from? You may know that if you cool the atmosphere down, without any change in the water vapour, the humidity of the air increases. It has less carrying capacity, and as a result, higher humidity. The Mars atmosphere has huge temperature changes often of 60 °C or more between day and night, and as a result, though it is so dry in the daytime, you get 100% humidity in the atmosphere at night, and you get this frost forming in the evening and early morning. If you think of a place on the Earth where you have 100% humidity you will probably think of the tropical rainforest. In those conditions you get plants that are able to take in water vapour just from the moisture in the air, and they have aerial roots that just go into the air and take in water vapour. So might there be something like that which is able to take advantage of these conditions of 100% humidity on Mars? It turns out that there is another analogue on the Earth which is not well known by most people and that is this rather humble little plant, a lichen. There are many different species of lichen able to do this, and they live in very cold places such as the high Arctic and up in the Alps and these sort of places, places where it is extremely cold, and there is no possibility of any liquid water, but you have the same possibility of humidity in the atmosphere which they are able to make use of, and that is how they are able to grow. Another great thing about these lichens is that in the conditions where they live, the ultraviolet levels typically are high. So they have the ability to protect themselves from ultravioloet radiation. With the very thin atmosphere on Mars, the ultraviolet radiation is extreme, and most Earth life would be sterilized within seconds on if exposed to the UV on the surface of Mars. 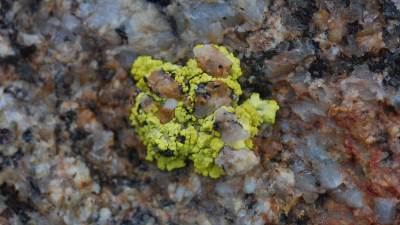 But this lichen is able to protect itself from ultraviolet light. If you are tanned or have naturally dark skin then you are protected by melanin. Well this lichen has melanin. It also has a couple of extra chemical tricks of its own. One is usnic acid as it is called, and the other is parietin. These are chemicals you wouldn't be expected to have heard of unless you had studied these lichens (usnic acid is also used in traditional mediine as a potent antibiotic). With the use of these it is very effective at protecting itself from ultraviolet light. So the researchers in the German Aerospace (DLR) had the idea of collecting these lichens and putting them into a Mars simulation chamber. We have been developing better Mars simulation chambers for some time. It is quite a hard thing to do as you can imagine with the extreme changes of temperature of day and night, and the thin atmosphere and the dryness in the day, and 100% humidity at night. Then you have to simulate the sunlight with ultraviolet light in it as well. At DLR they put this lichen into a Mars simulation chamber . They accurately simulated the UV component of the light on Mars, in a very accurate simulation of Mars sunlight, and of course no water at all just the very thin atmosphere as on Mars, and temperatures as on Mars. This lichen didn't just survive - there are some very hardy microorganisms that may be able to survive in these conditions - but it was able to continue to metabolize and continue to photosynthesize. This is a very surprising piece of research. This is recent , last few years, on going. They are doing a series of experiments, for a month, and then for longer periods, and take them up to the ISS and this sort of thing. So it is an on going experiment, but nothing has told against this conclusion, that this lichen, as far as we can tell, would be able to survive on the surface of Mars just as it is. It would be able to survive in this landscape where you have frost and so high humidity. It is not able to withstand full sunlight quite so well. So on rocks exposed to full sunlight in the middle of the day it might not do so well there. But when you have got a bit of shadow, somewhat sloped away from the midday sun, it should do just fine. It has sufficient protection to be protected from the UV, and it can also make use of the sunlight to photosynthesize, and it can metabolize. That really is truly remarkable result. There are many other possible habitats on Mars but it would take quite a while to go through them all. I go over this in more detail in Might there be microbes on the surface of Mars. First, there is the solid state greenhouse effect. We are all aware of the greenhouse effect nowadays, as made popular through the greenhouse effect of carbon dioxide in our atmosphere. Well the solid state greenhouse effect is when you have a layer of dry ice or ordinary ice, with rock or soil beneath it. In very cold places, you quite often find that a thin layer of ice on top of the rock and the soil will melt, through this greenhouse effect, creating a small habitable layer. This would happen in the polar regions of Mars. Another possible habitat may form from time to time in the polar regions of Mars over geological time. If you have an impact into the polar regions of Mars a lake forms briefly. Most of it freezes over quickly but if you look at what happens, if it is large enough then it can persist below this insulating and dry state greenhouse effect layer above it, and it can stay liquid for a thousand years at a time. Then for another possible habitat, there is clear evidence of salts on the surface of Mars and these, similar to the lichen, can take in water from the atmosphere and so could form a habitat that would be just below the surface of the soil. This is a possible habitat over much of the surface of Mars in the higher latitudes. You also see patterns on the surface that look as if they might be some form of life because they grow seasonally and then they contract. I don't think I'll talk about that too much, you can read about it in the Might there be microbes on the surface of Mars. They may be purely inorganic or may involve life. I have one more thing to show you and these are the warm seasonal flows. There are quite a lot of seasonal changes on Mars. It's quite a dynamic planet when you look at it in detail. Over much of the surface of Mars, it just looks like the Moon, and especially the highlands, where the atmosphere is very thin and you have lots of craters, and not much happens. But there are other parts that are very interesting. This is one of them. This is a one year cycle. These are streaks that form, and the slope goes down in the direction of the streaks, It looks very much as if there is some form of liquid flowing down this slope. You may have heard of the gullies on Mars, those are a different seasonal feature believed to be formed by dry ice. Then there is another thing, the Martian geysers and these are very active, just like Earth geysers it seems, that from the evidence of the debris they leave, that's another dry ice phenomenon. But these warm seasonal flows are very hard to fit to dry ice. Fr instance they occur on sun facing slopes and only form when soil temperatures rise above about 0C. and it is believed that it is some form of liquid. Though we can't quite understand quite how this can work long term. This liquid, presumably some type of underground aquifer, maybe through geothermal heating or maybe the salts in it keep it liquid, - if it flows down the slope every season, there must be some method for replenishing it, otherwise it would just all be gone over geological timescales of hundreds of thousands, or millions of years. It is a bit difficult to work out what that mechanism is that is able to replenish it sufficiently rapidly to explain these warm seasonal flows. But there have been lots of surprises on Mars and as we look at this more, it is very hard to imagine it is anything else except some kind of liquid, and the most obvious liquid is some kind of very salty water. So that is one possible habitat for life on Mars. There are quite a few more of these possible habitats on Mars, but I don't want to go into them in too much detail except just say they are there and we will come back to them. This is one of the reasons you want to keep Mars pristine, to study this possibility and see if there is life there, and see what form of life it is. It's especially interesting if it has managed to take a different form from Earth life. So there is the possibility of something like DNA with different bases (or a different backbone). Or could even be a completely different chemistry that we can't even imagine what it would be like. That is the very most interesting case, if that could exist on Mars. Here on the right you can see the global dust-storm. This is something that happens every Martian year, so roughly every two Earth years. So when Mars is close to the sun - it has a highly elliptical orbit compared to the Earth orbit which is much more circular. So when it is close to the sun, this is the dust storm season, you are much more likely to have dust storms. And these dust storms they sometimes merge together to create a single large dust-storm. And this can last for weeks or months. We have photos of these from the surface. This is Opportunity, and you can see that over a period of about 30 days, from solve 1205 to sol 1235, it got darker and darker and darker until 99% of the sun was cut out by the dust-storm. These dust-storms once they reach that dark phase, can stay at that stage for weeks, in the middle of the southern summer, when Mars is closest to the sun. This also leads to the Mars landscape as it appears to human eyes. Mount Sharp As Seen By NASA's Curiosity Rover, white balanced to resemble Earth sunlight. So that is one way these pictures may be misleading. It is not deliberately misleading. It is not like the scientists are trying to mislead anyone by doing that. They know exactly what they are doing. They do that because they are geologists, and the geologists want to be able to identify rocks, and it is extremely hard to identify rocks if you see them like the top photograph. They make the photos so that they look like they are illuminated by the Earth sunlight and it is much easier to make them out. You can also see the features are much clearer to human eyes, it is much easier to see the forms and shapes of the landscape in the bottom image, if you look at the same patch in both images. But this gives a misleading idea of what the Martian landscape would be like to human eyes. Especially if you see a blue sky, this is an absolute give away that its been done like this (except for the pale blue sunsets on Mars - a small patch of light blue around the sun as it sets). But even the butterscotch sky you sometimes see - it is much more dull more of a greyish colour really, the first photograph shows what it is like, it is rather a dull colour and the landscape is extremely dull in colour. You may know that in the Northern regions where I live in Scotland, many people find it quite difficult in winter. I suppose people who end up where I live, tend to be people who manage to cope with that, but you get people who get really sad, depressed in winter in Northern climates, it is called "Seasonal Affective Disorder" or SAD for short. So this something that may well happen on the surface of Mars, you might get very depressed. Because it is much worse than it is here, there is no interesting landscape to look at. It is just this dull sky and this dull landscape. If you want to see the bright landscape as in the stunning photographs of Mars, you want enhanced vision, so you want to put goggle son and see it through enhanced vision using cameras to look at the landscape. This is an attempt to deal with the situation both for the Moon or for Mars. This is called the suitport. The astronaut wears a kind of airlock on his back and the spacesuit is permanently attached to it. And behind him would be the spaceship itself and the astronaut crawls into the spacesuit through the hole in the back and wriggle their legs and arms into it. This thing you see behind him comes apart and one part goes on his suit and one part on the spaceship. So when he goes out they come apart and when he comes back he backs onto the spaceship and then someone behind will remove the hatch and then out you get. The suitport is quite effective for keeping the Mars dust out. But what it doesn't do is to keep the air of the habitat in.It leaks about a cubic foot of air from inside the habitat onto the surface of Mars every time you use it. A human being carries a surprisingly amount of micro-organisms. On my skin there are, estimated, a trillion micro-organisms in about a thousand different species many of which are not well understood. Coexisting with my body generally, outside and inside and everywhere, I have a hundred trillion micro-organsims, ten times the number of cells in my body and in ten thousand different species. Those species are not very well known at all. There is a whole project, the human microbiome project to try to characterize these species better and to understand them. And surprisingly it is quite possible that some of these micro-organisms might be well adapted to cope with Mars conditions, it is certainly not at all impossible, especially since they are not very well known. For instance there was an experiment, they used many micro-organisms from many different places on Earth and tried to find ones most able to deal to cope with very low atmospheric pressues such as the ones on Mars. So not in a liquid, in the atmosphere and if it would be able to live in those conditions. One of the most promising micro-organisms they found was not only able to survive but able to metabolise in the atmosphere was isolated from human saliva. Was just in the database of all the things they looked at. You might ask, why might a micro-organism that lives on the human tongue have the capability to live in very thin atmosphere. But you do just get things like that. Microorganisms pick up these capabilities in the past, and they don't lose them, they tend to keep them. So though it is now living in human saliva - before maybe it was in the upper atmosphere or something, who knows, but for some reason or other it developed this capability to be able to deal with these conditions. So if a human arrives on Mars, as soon as you start walking about on the surface, you need a spacesuit, and it is probably not widely known, but if you need movement at the knees and elbows, and if you've got one that's very flexible for walking about the surface of Mars, then these leak air continuously. So you've got a leaky spacesuit and you are also leaking air every time you get out of your hab, it seems, how can you possibly keep microorganisms in. Remember the smallest microogranisms are as small as 0.2 microns, where a micron is a thousandth of a millimeter, so even the tiniest of holes, or fabric would let them escape, and these spacesuits leak air all the time. I've read various papers on this and everyone accepts, as soon as you have got spacesuits on Mars you are going to have microorganisms leaking, and getting out onto the surface. Then even more so if you have anything that goes wrong, say the habitat crashes. Even if the humans survive, the interior of your habitat, whatever you've got there, food, plants or whatever, it's another possibility of contamination. Then if you have some kind of an accident involving human beings, and if someone dies on Mars you are not going to keep them forever in your habitat. Also it is very difficult to keep these systems totally enclosed. Will you never ever need to vent the air or deal with some waste that you can't cope with and 100% recycle inside? It is really very hard with present day ideas of technology to imagine that you could possibly colonize Mars or even have a surface visit to the surface of Mars without microorganisms getting onto the surface. It used to be thought that any microorganisms would be sterilized within seconds by the UV light. But it is now known that there are microorganisms that can survive the UV for hours. And it just needs to fall down in a shadow to be protected from the UV, never sees the UV light at all. So it seems not at all hard to end up having viable dormant microorganisms on the surface, and surely there would be numerous viable dormant microorganisms on the surface of Mars after a human visit. With such large quantities of microorganisms, some of these surely would get into tiny cracks in the dust, which are, made of iron oxide good at filtering out UV light. Carl Sagan was concerned about this long ago, that microorganisms imbedded in a grain of dust could spread anywhere throughout the surface of Mars. We know there are caves on the surface. Dark pit on the Arsia Mons volcano - this one is at least 178 meters deep. If a grain of dust carrying life from Earth got blown into a deep cave it would be protected from cosmic radiation as well as UV light and so could potentially survive there in viable state for millions of years. So dust could be blown below the surface of Mars and could end up tens of meters below the surface which means it is not only protected from UV light but also from cosmic radiation which means that even over periods of millions of years it could still be there. Some microorganisms are able to stay dormant and then revive after millions of years. So one way or another these are going to be spread out over the surface of Mars originally in the vicinity of the human settlement and then more and more in the dust storms and it seems it would be impossible to reverse that. The situation was more optimistic when we thought UV light was much more sterilizing than it is now. There are ideas to throw dust up into the air from around the human habitat and that might be enough to sterilize it. But it is rather hard to see that working now. Before anyone thinks of sending human missions to the surface of Mars, unless you have come to the decision that it is okay to contaminate Mars irreversibly, then I think you need very thorough studies to show that you are not going to do that. Especially with these studies of possibilities of habitable environments on Mars. I think you need to be absolutely 100% sure that you are not going to do that. In the rest of this series I'm going to go on and talk about alternatives to colonizing Mars, other possibilities for colonization. So we are not going to say an absolute no, don't colonize outside Earth, but it does seem Mars is far from ideal. So where is the best place to colonize. Then, we do want to explore Mars. So how should we explore Mars given that humans are by far the best way to explore places. If you can have boots on Mars then it seems that in many ways that is the best way to explore Mars. However you have got the paradox that putting boots on Mars might very well irreversibly contaminate it with life able to reproduce and spread over the surface of Mars. Indeed even if it doesn't contaminate it, many of our instruments can detect a single amino acid or a single molecule or fragment of DNA. How can you possibly avoid contaminating the entire area around your habitat, when just the minutest contamination even of dead microbes can immensely complicates any search for the signs even of ancient life there? It is really very hard to see humans on the surface of Mars doing these very delicate experiments that require no life anywhere near the apparatus. So what is the best role for humans for the exploration of Mars? But human beings are obviously a great asset and we want them to be able to explore Mars. So we have a bind, we want humans to explore Mars, we want boots on the surface, but then it seems, how can we possibly do that without introducing at least a far greater possibility of irreversibly colonizing Mars with Earth life and contaminating it. So that is what I'm going to be talking about next, a way we can get through that conundrum, and also the other ways of doing colonization. 3. If Mars Is For Hardy Explorers Only, Where Is The Best Place In The Solar System For First Time Colonists? 1. Mars, Planet Of Surprises, Great To Explore Not So Great To Colonize - 1. Is It As Good A Place To Live As A Desert? For a shorter treatment, see:: Ten reasons NOT to live on Mars - great place to explore. For more about the possibility of life on Mars: Might there be Microbes on the Surface of Mars? and other articles in my column.